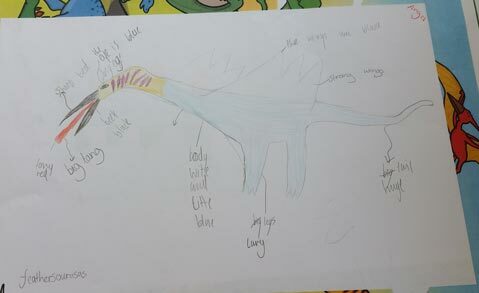 As part of Everything Dinosaur’s outreach activities supporting summer schools we challenged one group of Key Stage Two children to have a go at designing their very own dinosaur. We explained how diverse the Dinosauria were and the various ecological niches occupied by this group of ancient reptiles then we set the children to work. We wanted to help encourage their creativity as well as to get them considering such aspects as adaptation, diet and habitat. We received some very colourful and indeed, very creative illustrations. 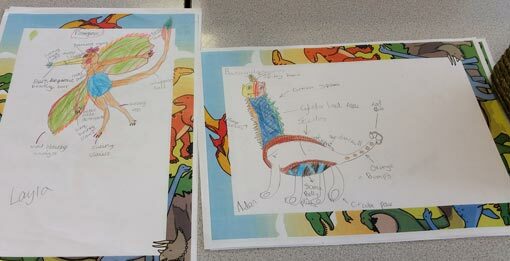 Colourful and carefully thought out dinosaur designs. This assignment was part of a wider project which Everything Dinosaur team members were involved in. The focus was on literacy and coming up with imaginative and fun ways in which we could help the children with their writing. The dinosaur topic and related scheme of work certainly proved very popular with the children. The teaching team and volunteers were extremely enthusiastic too. We explained the link between dinosaurs and birds. With our dinosaur expert having explained the link between birds and dinosaurs and shown examples of feathered dinosaurs such as Microraptor, Beipiaosaurus, Therizinosaurus and Caudipteryx, naturally we got a lot of feathers in the children’s dinosaur designs. Meat-eating dinosaur creations proved the most popular, especially with the boys, but there were also plenty of plant-eating dinosaurs created as well. Lots of long-necked dinosaurs, dinosaurs with horns, even armoured ones. It certainly was a very creative exercise. Commenting on the work undertaken by company, a teacher praised Everything Dinosaur for the provision of some inspiring resources.